The Indian women's hockey team entered the finals of the Asian Games for the first time since 1998, after defeating World No. 11 China 1-0 in their last-four match at the Gelora Bung Karno Hockey Field on Wednesday. 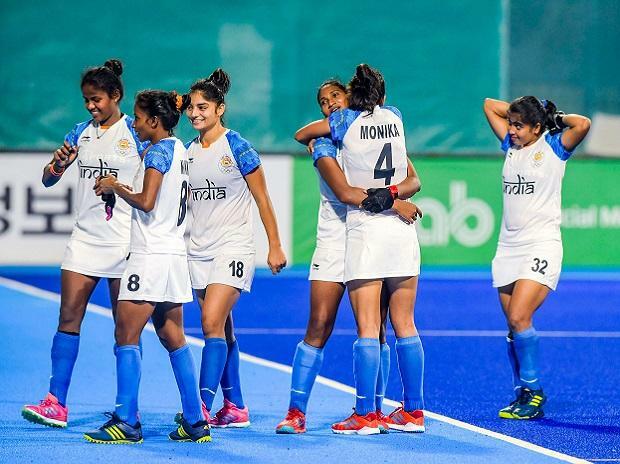 The Indian team had the opening chance of the match as Vandana Katariya and Navneet Kaur combined inside the striking circle but failed to score a goal as China defended well. In the 8th minute, Navneet Kaur won India their first Penalty Corner which was taken by Gurjit Kaur but her shot was deflected away by the first Chinese rusher. The start of the second quarter saw China produce some slick passing in the Indian striking circle which won them their first PC in the 18th minute but the resulting drag-flick was hit wide of the post. China tried to create chances in the next few minutes but the Indian defence made sure that they eliminated the threat. The Chinese team tried to keep more possession as they grew into the match, but the World No. 9 Indian team made sure that they pressed their opponents to win back possession. The second quarter was a period of few chances for both the teams which meant that the scores remained level at 0-0 as the hooter signalled for the half-time break. India started the third quarter by winning their second PC in the 31st minute. The resulting drag-flick was taken by Gurjit Kaur which saw her strike a fierce low shot towards the right side of goal which was saved by a Chinese defender. India tried to strive forward to create more opportunities in the next few minutes but found it difficult to get inside the Chinese striking circle. The 39th minute saw India win their third PC of the match which was struck by Gurjit Kaur through a variation but went wide of the goalpost to keep the scores goalless. India won themselves another PC in the 41st minute, however, Gurjit Kaur's shot was stopped by the Chinese goalkeeper Jiao Ye. India continued to dominate the match and Reena Khokhar came close to scoring in the last minute of the quarter as she wriggled past three Chinese defenders to enter the striking circle and get a reverse shot away, which went just wide of the goalpost. The Indian team attacked the Chinese from the start of the fourth quarter as they looked for a goal. Captain Rani came close to scoring but her shot was deflected away by a Chinese stick. With just nine minutes remaining on the clock, India had a chance again as Rani played a ball across the Chinese goal but the World No. 9 could not score. The 52nd minute finally saw India get the breakthrough as they won three consecutive PCs. China defended the first two executions well, but it was drag-flicker Gurjit Kaur who was successful on the third attempt as she struck the ball in the top right corner of the goal to give India a crucial lead. The Indian team kept possession of the ball in the final few minutes of the match and made sure that they did not allow the Chinese any opportunities to equalize. The win means that the Indian women's hockey team will face Japan in the final of the 18th Asian Games Jakarta-Palembang 2018 on Friday, August 31.